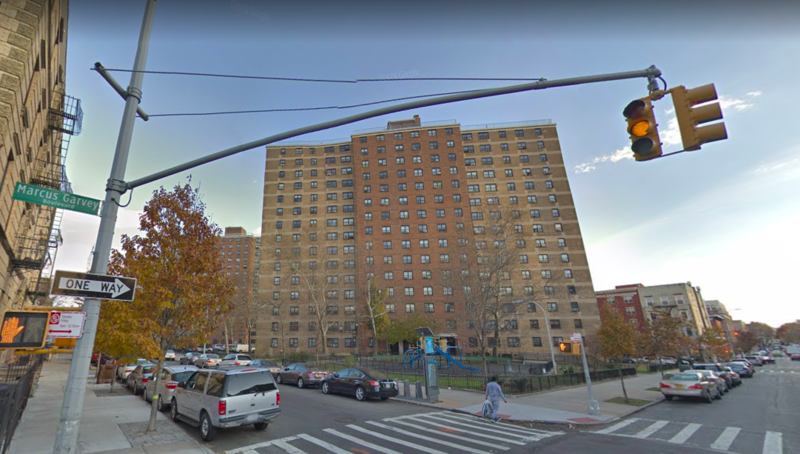 Yesterday, two fatal shootings in Bed-Stuy claimed the lives of two men a few blocks apart, just after the NYPD announced another historic drop in overall homicide rates. The first shooting took place around 2:00 pm on Tuesday, December 4, at Marcus Garvey Boulevard and Pulaski Street, near the Roosevelt Houses, police said. Officers arrived on the scene after a 911 call to find a 21-year-old man who had been shot in the neck. EMS rushed the wounded victim to Woodhull Hospital, where he was pronounced deceased. As officers further investigated the scene, they found a second victim from the shooting a block away, at Marcus Garvey and Dekalb. The 22-year-old man who had been shot in the hip. He was transported to Kings County Hospital in stable condition. The name of the deceased has been withheld pending family notification. Later that night, just before 10:30 pm, police received another call about man shot, this time at the Sumner Houses, less than half a mile away. Arriving to 979 Myrtle Avenue, officers found the body of a 35-year-old man who had been shot in the head. EMS pronounced him dead at the scene. The second victim has yet to be named by police, pending family notification. While both shootings occurred in close proximity, it’s unclear whether they are related. Investigations have been opened into each, though no arrests have yet been made. “The first shooting took place around 2:00 pm on Wednesday, December 5,” Today is Wed, roughly 2:pm. It looks like there’s a day typo in the story.